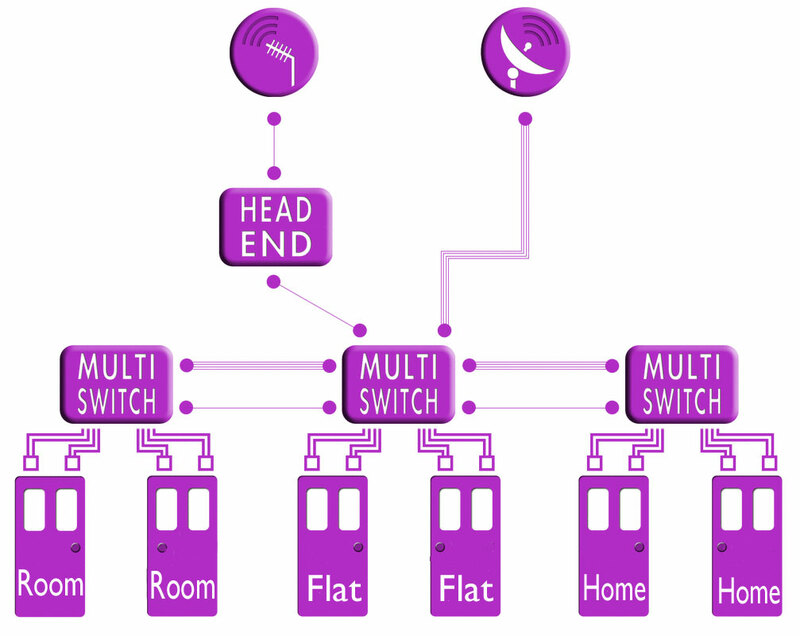 Fibre Integrated Reception Systems (FIRS) are quicker and more enhanced Integrated Reception Systems (IRS) aimed at private landlords, local authorities, housing associations and commercial builders, where there is a requirement to provide the end-users with any permutation of Sky, Sky Q, Sky HD & 3D, Freesat, Freeview and radio services. With FIRS, a single set of aerials and satellite dishes can covers a larger geographical area, thereby giving a greater number of users access to the latest digital entertainment without the need for individual satellites or aerials. A single Fibre IRS system can cover hundreds of homes in excess of 10km radius of the exchange. With a single central management point maintenance costs are reduced. Fibre installations needing fewer cables, holes and dishes can be less costly that traditional coax for surprisingly small projects and your savings will grow as the project, building or estate scales up. Conventional IRS systems send TV and satellite signals via coax cables and whilst reasonably efficient have limitations in distance and consistent signal quality. Advances in fibre optic technology now allow these services to be delivered over several miles via Fibre IRS OR FIRS. Because FIRS is not subject to electrical interference and fibre has minimal degradation so the signal is dependably, scalably, excellent. Digital Direct can create a bespoke FIRS system to meet any requirement to deliver local TV services, Sky satellite or international satellite services in practically any language. As fully trained Registered Digital Installers and with over 20 year’s industry experience, Digital Direct Aerials can manage your full Fibre Integrated Reception System (FIRS) installation requirements. Our team is dedicated to excellence and meeting the needs of clients and residents according to each contract. Much careful planning and design goes into the creation of a new development but the ‘architect’s vision’ can quickly be spoiled when residents add their own satellite dishes and aerials. With careful and strategic planning, multiple satellites, including a variety of foreign satellites, can be connected to each property providing a service tailored to the language/interests of all residents with no unsightly dishes spoiling the appearance or contravening any local regulations or covenants. Call Digital Direct now to discuss your Fibre IRS systems.